If this is of any help, my name’s Pete Brown and I’ve got a feeling I was a founding member of Squashed Hedgehog. I’m a bit vague about the details, but I was playing in the band with Simon Welch, Kevin Osborne, and a guy called Stefan (can’t remember his surname, but he played a beautiful, blond semi-acoustic). Simon, Stefan and I were all working at the Tamworth Herald at the time and would rehearse in my Dad’s garage in Salters Lane, Tamworth. Stef and I were the guitarists, Kevin on bass, Simon vocals. Can’t remember who the drummer was I’m afraid. I pulled out of the band eventually, and remember going down to The George pub to give them moral support for a midweek gig there. 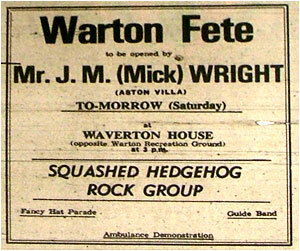 If they weren’t called Squashed Hedgehog then, they were certainly a forerunner of the band. By the way, you may be using some of my old articles on your site, as I did some reviews and articles for Musicbox back in the 70s. I wish I'd saved them all to pass on to you. I now live in Sydney, Australia, and still play in dodgy bands - you're never too old to rock 'n' roll! Some years after I left the Herald I ended up working on The Star at Sheffield, where for some reason I was branded a headbanger and sent to review many of the metal bands that came through. I wish I'd kept all the hate mail after one of my UFO reviews (and I quite liked UFO!) I also remember leaving a Chesterfield club after seeing a very young and unknown Def Leppard and saying to a mate: "Well, they were crap." I was right there then!